The little whippersnapper was too tiny to tag, but definitely deserves some points for biting a big hook! 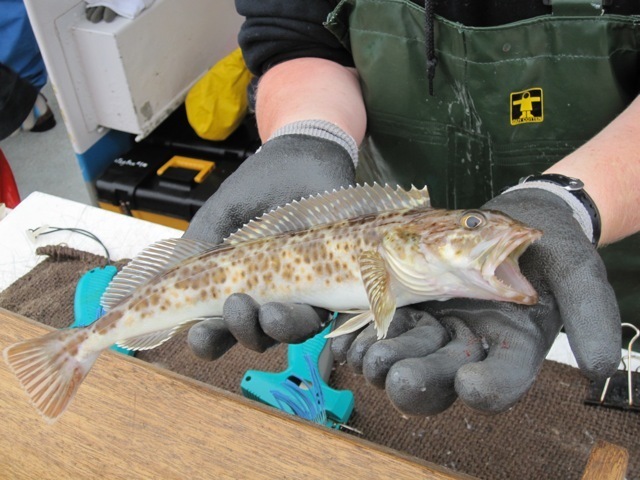 This young lingcod was caught during a marine protected area survey at Año Nuevo as part of the California Collaborative Fisheries Research Program. Lingcod do have a reputation on our surveys for biting off more than they can chew (or swallow). This entry was posted in Cool Creatures, Research: Fresh from the Field and tagged fieldwork, fish, fishing, marine protected areas, surveys. Bookmark the permalink.